Products for all spiritual people. From personal care and decor to custom items and ritual supply and more. 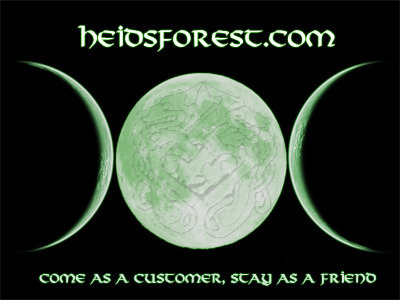 Heidsforest is now again open and ready to serve you in your spiritual needs.With more than 800 items we can offer you a great selection of alternative and ritual supplies, beautiful decor and incredible gift ideas. If you have any requests or need guidance on any of our products you are more than welcome to contact us. Come as a customer,stay as a friend. Heið's Forest is here to fulfil your needs as you seek peace, relaxation, focus, and well being no matter what your spiritual path may be. Items offered will cover everything from decor, spiritual and ritual supplies, massage and aromatherapy, as well as some inspiring jewelry and garden decor. At present, our web site is new and we will be adding more pages for you to enjoy. We are making an effort to present you with our entire spectrum of offers as soon as possible. At this point we can provide you with information regarding our products and custom merchandise.They are available for purchase now. The emphasis of our site is on spiritual growth and well being. This topic is certainly of interest to you. Check this site frequently as we often update. In the meantime you can reach us at heidsforest@hotmail.com . We are looking forward to hearing from you. If you are not familiar with what we offer we will be more than happy to help. Disclaimer: Products offered are for positive spiritual use only and Heið's Forest will not cater to the black arts or the practice of the left hand path.